France, 2007, 90 minutes, Colour. Catherine Deneuve, Thomas Dumerchez, Guy Marchand, Elodie Bouchez, Adrien Jolivet. Gael Morel has made a number of interesting films about French young men and their relationships amongst themselves and with their families. A frequent collaborator has been Christophe Honore (Ma Mere, Dans Paris, Chansons d’Amour). 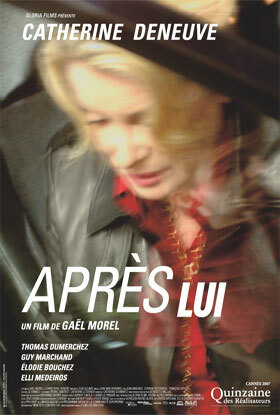 Honore’s films tend to have a great deal of dialogue with lots of abstract reflections on life and love. When he collaborates with Morel, the characters and plot drive the film rather than the reflections. This makes them more interesting and accessible. The plot of Apres Lui is quite straightforward. We are introduced to a young man and his best friend. They go to a party and one is killed in a car accident while the other was driving. The mother of the dead man is distraught at the death of her son but is outwardly controlled while the grief affects her heart and her mind. She becomes more and more obsessed by his death and tries to keep his memory alive by focusing her attention on the driver, keeping alive the memories through him. This has repercussions on her ex-husband, especially in her inviting the friend to the funeral, on her expectant daughter whom she ignores. The young man’s parents also become disturbed. Catherine Deneuve (in her 99th film) gives a powerful performance as the mother, on screen for most of the film. One can appreciate her grief and how it has taken possession of her but we, like her family and friends, become more and more exasperated with her behaviour. In a sense, the film suddenly stops – but it leaves the audience thinking about what could possibly happen after this. 1.The title, the focus on the son, on the mother? A portrait of grief and acting out after grief? 2.The film’s perceptions of the mother, the family, Franck? The effect of the accident on all of them? 3.The setting of Lyon, the city and its environment, homes, migrants? The musical score? 4.The introduction to Mathieu and Franck? Easy together, dressing up, horseplay, their friendship, preparing for the party, the dresses, Camille’s help? 5.The news of Mathieu’s death, the immediate effect, the hospital, Francois, Camille, Laure, her husband? Her pregnancy? The reality of death? 6.The funeral, at the graveside, at the home, all those present, the range of friends, the young friends of Mathieu, the invitation to Franck to come, the young people’s reaction and hostility, his being hurt, going upstairs, Camille going up, Francois allowing him to be there but hostile, Laure? 7.The portrait of Camille, Catherine Deneuve’s presence, the two children, her ignoring Laure, her grief, it becoming obsessive, Mathieu’s room, the memories, her not being able to weep, the discussions with her husband, his support, his final exasperation, Laure and her being hurt, asserting that she was alive, the birth of her child, Camille being present, but ignoring her daughter? Going to work, seeming calm, the discussion about books, ordering books? 8.Franck, his Portuguese background, his family, his friendship with Mathieu, the fact that he was driving, Camille and her care for him, the effect on him, his attitude, wanting to be free from her? 9.Camille going to the classes, discussions with the lecturers, her son’s achievement, her wanting Franck to pass, to achieve the same grades, his not working, at the work site with his father? Her intervention? 10.Franck in himself, the fact that he was driving, his sadness, the effect of the death on him, spurned by the friends, the effect of the funeral, the aftermath? With Camille, her help, at the work site, her fostering him? 11.The young friends, at the funeral, afterwards, Camille meeting them, the coffee, the talk, their leaving? Concern but puzzle? 12.Franck’s parents, their going to see Camille, warning her away? 13.Franck’s decision to go to Portugal, Camille and her decision to follow him, the flight, finding his room, going into his room, his being asleep, her watching? 14.The film ending at this moment? The overall portrait? Grief and obsession? What she would do now – and its effect on Franck? The consequences of grief?